Our world-exclusive invitation to witness the de-vanning process of the first three (followed by the second three) Lexus LFAs to arrive in the United States led to a clamor by other automotive media to witness the process for themselves. Jonathon Ramsey of Autoblog wrote an excellent and very informative account of the process for LFAs number 018 and 027. #018 is Pearl Blue with blue interior, dark premium metallic wheels and yellow calipers, while LFA #027 is Black with white leather interior, dark premium metallic wheels and red brake calipers. My.IS member shinto informs us that the Pearl Blue #018 was delivered by Sterling McCall Lexus in Houston, thus becoming the second LFA to be delivered in the Houston area after 004. 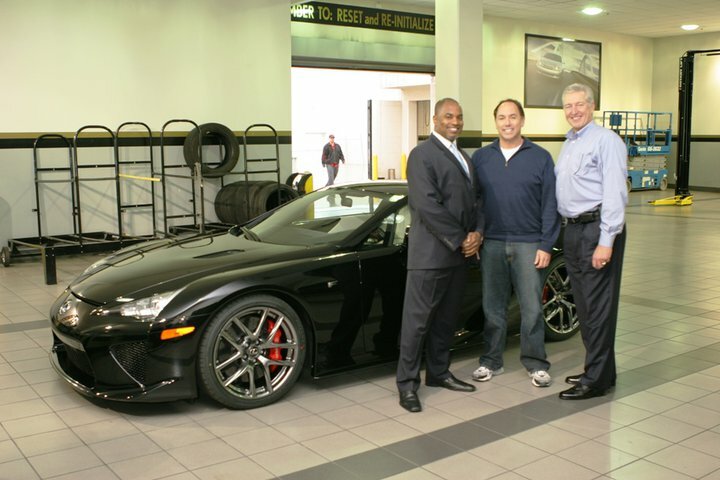 As to the black #027, the Longo Lexus Facebook page via Club Lexus member LexusMan77 informs us that, indeed, it was delivered at the U.S.’s second-largest Lexus dealer (behind just South Florida’s JM Lexus) to a very lucky gentleman named Adam, who is at the center of the photo below. This entry was posted in Lexus, LFA by Joaquín Ruhi. Bookmark the permalink.